Don't neglect the yearly job of pruning your roses. With very few exceptions, all roses benefit from proper pruning as it assures healthy plants with the ability to produce flowers of good size and quantity. Early spring, when buds are just beginning to show on the canes is the best time. However, if you live in a mild climate, you can prune in late fall, as soon as the plants go dormant. When pruning roses, start by removing all dead canes just above the graft. Weak and thin canes and those that cross over should also be removed at the base. Part of this process should include removing suckers and any growth of rootstock that may be emerging from the ground. Now stand back and look at the plant. If there are a lot of canes in the center of the bush, take out the smallest ones to improve air flow. Next, for established roses, you should prune the remaining stems by about one half their length. I know - you might think this cruel - but it is in the plant's best interest. Look for buds that point outward and make your cuts about 1/4 inch above which a good sharp bypass pruning shear. Position the shears so that they are at a 45 degree angle, and pointing toward the center of the rose bush. This encourages new growth to develop outwards. If the branches of the rose bush grow outward, it will receive better sun distribution and air circulation, and have a more attractive shape. To forestall problems, seal cuts on stems that are wider than your little finger with white wood glue. (Elmers works just fine and is inexpensive) Sealing the cuts speeds up and helps healing, which makes the process of pruning less traumatic for the plant. More important, sealing protects against any insect borers that may enter through recent cuts. 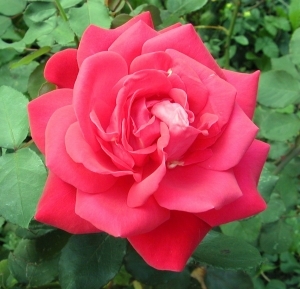 During the active growing season, inspect your rose plants and flowers for vigor. If you find canes that are poorly positioned (growing inward rather than out), remove them once their bloom has faded. Practice deadheading. Deadheading refers to removing dead blossoms from the plant. Cut the stems of the faded bloom just above a five leaflet leaf that has its bud pointing outward. Practicing proper and regular pruning techniques will assure you of healthy, long-lived rosebushes and reward you with beautiful blossoms for years to come.